The U.S.S. 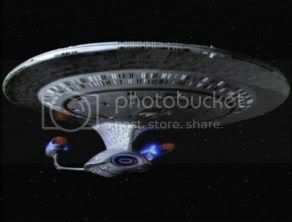 Explorer, NCC-74685-A, is a Galaxy-Class starship and the chief flagship of the Federation Expansion fleet. Following the secret war conducted by a number of neural parasites which almost brought the United Federation of Planets to it's knees, the brain-controlling creatures were defeated through the combined efforts of Zon Huntreas and the Jedi Order, along with the majority of the crew from the original U.S.S. Explorer, many of whom had been disgraced and declared traitors during the interim. With the original Explorer destroyed by Goa'uld forces and Starfleet eager to reinstate the officers which were now recognized as heroes to the Federation, they quickly offered Captain Huntreas the command of the recently-constructed U.S.S. Everest, and renamed the vessel Explorer in honor of the crew, and the first starship to reach another Galaxy. The new U.S.S. Explorer launched from the Utopia Planetia Shipyards on Mars in early 2383. Reassigning the vessel to act as the flagship of the Federation Expansion and it's fleet, the 1st Intergalactic Fleet, the Explorer would go on to become involved in a number of the most important events in the Arkanis Sector. Under Captain Huntreas' leadership, the vessel lived up to her namesake, initiating first contact between dozens of new races. The Explorer was a primary part of the initial mapping of the Federation Expansion, and discovered a number of new worlds for colonization. The ship's scientific capablities also came in handy when Starfleet used it, along with several other mission-specific vessels, in a study designed to map the Route of Ages. As a charting mission it was a failure, but Starfleet learned a lot about the nature of the interdimensional gateway through the investigations which were run off of the Explorer. However, not all of her missions were so peaceful. The Explorer participated in a number of tactical manouvers through her short career, often acting in a defensive measure against hostile ships coming through the Route and attacking the local spaceports. The Explorer personally exchanged fire with starships from the Covenant, the Peacekeepers, the Goa'uld, the Kilrathi, and the Cylons. Right off of the bat, the Explorer found herself caught in the midst of the Goa'uld/Peacekeeper War. While Captain Huntreas was capable of keeping her out of most of the major engagements, he quickly found himself taxing the ship's new engines past their specs in an attempt to keep up with the Pheonix Force, which had taken residence in the body of Angel Daiko. It was during this event that Captain Haweke Karbn came to rest onboard the ship, having had his mind taken over by the Ancient's Library. Though he was eventually cured through a mental interface he had designed onboard the ship's holodeck, he left behind a number of arcane, subspace equations in a holoprogram. After inputting these equations into the intermix formula of the warp drive (with the help of the engimatic Slider), the Explorer was sent careened to the very edge of the Universe itself, to a realm where thoughts became reality. After unintentionally awakening the Egg-Creature known as the Saint, the Explorer became known as the Bringer of Death to the people of Atari VIII, a system which the creature consumed. Later in that year, the Explorer initiated first contact with the mysterious Vorlons, who seemed to expect them. Following the Harkonnen Invasion of Tatooine and subsquent Cylon occupation of the planet, Zon took command of the Explorer and attempted to open formal negotiations with the robotic race. These negotiations ended in utter failure, the Cylons only interested in gathering tactical data on the ship. Thanks to the skill of the Captain, Zon was able to showcase the Explorer's powerful tactical systems, anihilating a total of twelve Cylon Basestars in a single engagement. Later, when the Wraith attacked from a future timeline, the Explorer vanished into the timestream, where it appeared a thousand years from the present, and then later stole an advanced starbase from that time and brought it back to the year 2385 in order to fasciltate the upcoming war with the Shadows. Following this event, the Explorer was reasigned to Captain T'mlik, with Captain Huntreas being sent to act as the first official Starfleet attache and Federation Ambassador to the Kukai Foundation. A year later, the Explorer was late to defend New Archer from the onslaught by the Goa’uld System Lord Thel, coming late to the battle and suffering from minor damage. As the war with the System Lords dragged on, Starfleet, at the behest of Captain T’mlik, decreed that the Explorer would undergo a major refit at the shipyards of the Kukai Foundation. While Captain Dalmark Stranton would argue to upgrade the weapon and shielding grids of the Explorer, (then temporarily decommissioned) Zon Huntreas, as well as T’mlik, would argue against it, citing that as a Galaxy-class ship, it’s operation is primarily for peaceful contact with new civilizations. In the end, a compromise would be found, with the ship receiving updates to it’s phaser arrays and the addition of two Pulse Phaser cannons on the side of the Stardrive section of the ship. The Refit would mostly be internal, upgrading nearly every aspect of the ship to bring it more in line with the current advancements in Starfleet technology. The sensor grid was updated, the Warp Core entirely replaced, and supplemented by a working Quantum Slipstream drive engine. This gave the ship a new flexability, being one of the few Starfleet vessels which, utilizing slipstream and the Hyperspace-Subspace Barrier Coefficient, could reach speeds similar to that of the New Republic hyperdrive. Weapons and shields were also upgraded, and the computer core purged of any Goa’uld or Cylon sleeper viruses, as well as mostly replaced. However, T’mlik would turn out to be a Goa’uld agent, the System Lord S’Tan, and Zon Huntreas would once again be assigned to Captain the ship, selecting Lieutenant Commander Haweke Karbn to replace him as the Starfleet Liason officer to the Kukai Foundation. Defenses: Deflector shields, High density hull. The Explorer was one of the Galaxy-class starships built in the wake of the Dominion War, when the vessel's state-of-the-art technology had become over twenty years old. To combat this, Starfleet refitted the U.S.S. Mayborne in late 2379, and based the new redesign on that ship's specifications. The Explorer was capable of a much higher maximum warp than it's predecessors, and was equipped with limited bioneural gelpacks in order to expediate starship functions. The hull of the Galaxy-class was left somewhat customizable; areas such as Deck 8 were designated as unfinished and multi-purpose, in the event that extra space was needed for a specific mission. The Explorer was for a short time capable of Quantum Slipstream travel, which despite Zon's familiarity with the drive systems, proved too unstable to be used onboard a Galaxy-class starship. Thanks to the Hyperspace-Subspace Barrier Coefficient, the need for Quantum Slipstream drives has lessened. However, when Zon constructed a second Slipstream drive for the Gekkostate project, he would incorporate it into the Explorer and restore its slipstream abilities to full.